I started this project fully intending to draw every day. I haven’t. The past couple of days have been quite hectic for me and I wasn’t able to sit down and sketch on those days. Life gets in the way sometimes and I know I mustn’t feel guilty about this. It’s a fun project and if guilt taints the fun, it just becomes a chore instead. I did have some time today so I’ve done two to atone for my ‘sins’! The first one, a pair of scissors, continues my earlier still life drawings but I was starting to get a bit bored of doing that. When Lou mentioned drawing with her eyes closed, I decided that I needed a little injection of that here too. This is a frog. I used fingers of my left hand to help guide and gauge where I should draw. 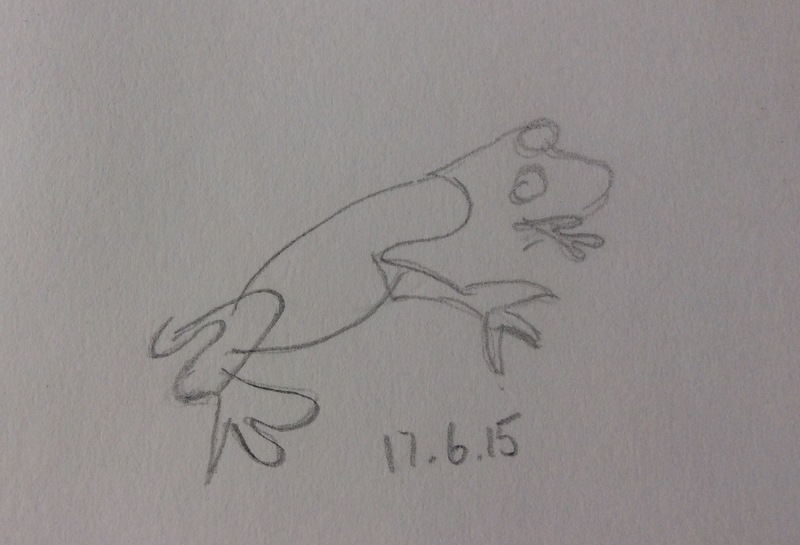 The only slight cheats happened when I realised I’d forgotten to give the frog two eyes. I closed my eyes again and drew the second eye. Because the lines were quite feint, I went over them again with my eyes open to make sure they could be seen clearly. I promise I didn’t change the position of anything! Today I’ve attempted something a bit different. A few days ago I found some very old photos I took in Spain around 1970. They record a Spain very different to how it is today. I’ve tried to reproduce two of those photos as sketches. 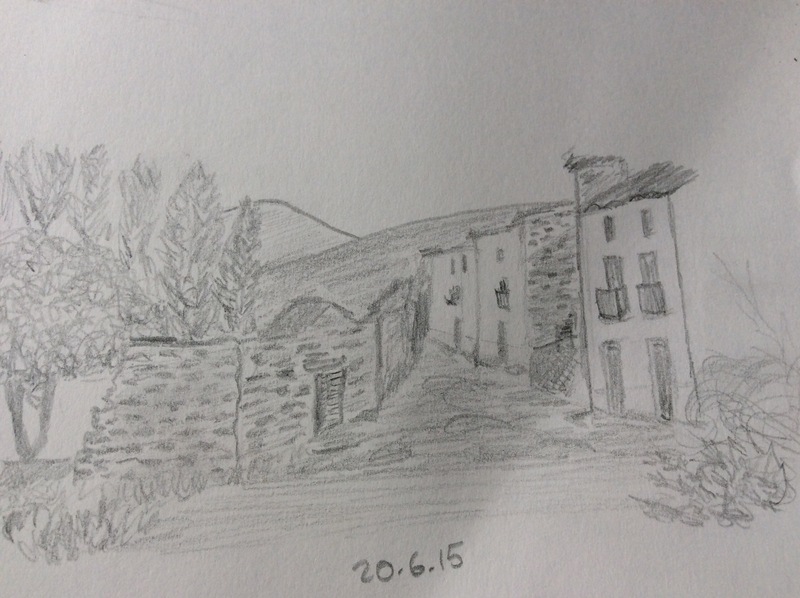 This first one shows the end of the road where my uncle lived in a village in Navarra called Murchante. There was no tarmac, just a dust track leading into the fields and a man riding a donkey approaches. I have to tell you it’s a donkey because I don’t think it’s very recognisable! Even though the it was only a small element, it was very hard to draw! 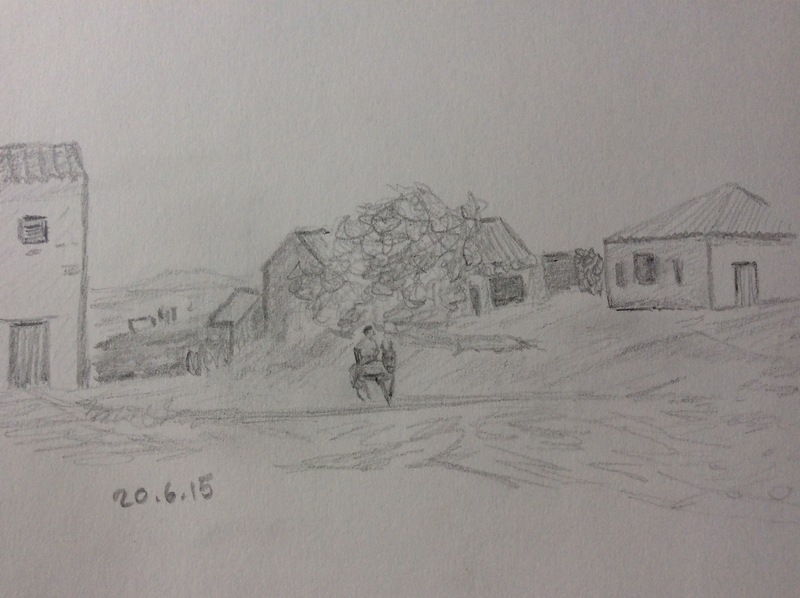 The last of today’s sketches shows the village of Vozmediano in the province of Soria around 1970. My aunt and cousins lived there at the time. Again, there were no tarmacked roads here nor any running water, apart from the River Quieles which has its source here. Vozmediano is a tiny village. I just read on Wikipedia that in the 2004 census there were only 45 residents. Enjoying your pics & comments Sue. Thanks for sharing.